The tremendous rewards of high-adventure treks are drawing more and more people to the backcountry. At the same time, the vast territory suitable for treks is shrinking in size. More people and less land mean we all must be careful not to endanger the wild outdoors we have come to enjoy. A good way to protect the backcountry is to remember that while you are there, you are a visitor. When you visit a friend you are always careful to leave that person's home just as you found it. You would never think of dropping litter on the carpet, chopping down trees in the yard, putting soap in the drinking water, or marking your name on the living room wall. When you visit the backcountry, the same courtesies apply. Leave everything just as you found it. Hiking and camping without a trace are signs of an expert outdoorsman, and of a Scout or Scouter who cares for the environment. Travel lightly on the land. The Principles of "Leave No Trace"
"Leave No Trace" is a nationally recognized outdoor skills and ethics education program. 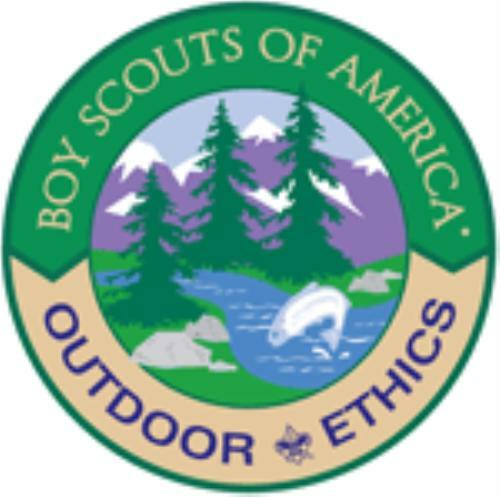 The Boy Scouts of America is committed to this program. The principles of Leave No Trace are not rules; they are guidelines to follow at all times. The Leave No Trace principles might not seem important at first glance, but their value is apparent when considering the combined effects of millions of outdoor visitors. One poorly located campsite or campfire is of little significance, but thousands of such instances seriously degrade the outdoor experience for all. Leaving no trace is everyone's responsibility. Proper trip planning and preparation helps hikers and campers accomplish trip goals safely and enjoyably while minimizing damage to natural and cultural resources. Campers who plan ahead can avoid unexpected situations, and minimize their impact by complying with area regulations such as observing limitations on group size. Damage to land occurs when visitors trample vegetation or communities of organisms beyond recovery. The resulting barren areas develop into undesirable trails, campsites, and soil erosion. Concentrate Activity, or Spread Out? In high-use areas, campers should concentrate their activities where vegetation is already absent. Minimize resource damage by using existing trails and selecting designated or existing campsites. In more remote, less-traveled areas, campers should generally spread out. When hiking, take different paths to avoid creating new trails that cause erosion. When camping, disperse tents and cooking activities-and move camp daily to avoid creating permanent-looking campsites. Always choose the most durable surfaces available: rock, gravel, dry grasses, or snow. These guidelines apply to most alpine settings and may be different for other areas, such as deserts. Learn the Leave No Trace techniques for your crew's specific activity or destination. Check with land managers to be sure of the proper technique. This simple yet effective saying motivates backcountry visitors to take their trash home with them. It makes sense to carry out of the backcountry the extra materials taken there by your group or others. Minimize the need to pack out food scraps by carefully planning meals. Accept the challenge of packing out everything you bring. Backcountry users create body waste and wastewater that require proper disposal. Wastewater. Help prevent contamination of natural water sources: After straining food particles, properly dispose of dishwater by dispersing at least 200 feet (about 80 to 100 strides for a youth) from springs, streams, and lakes. Use biodegradable soap 200 feet or more from any water source. Human Waste. Proper human waste disposal helps prevent the spread of disease and exposure to others. Catholes 6 to 8 inches deep and 200 feet from water, trails, and campsites are often the easiest and most practical way to dispose of feces. Allow others a sense of discovery: Leave rocks, plants, animals, archaeological artifacts, and other objects as you find them. It may be illegal to remove artifacts. Do not dig tent trenches or build lean-tos, tables, or chairs. Never hammer nails into trees, hack at trees with hatchets or saws, or damage bark and roots by tying horses to trees for extended periods. Replace surface rocks or twigs that you cleared from the campsite. On high-impact sites, clean the area and dismantle inappropriate user-built facilities such as multiple fire rings and log seats or tables. Good campsites are found, not made. Avoid altering a site, digging trenches, or building structures. Some people would not think of camping without a campfire. Yet the naturalness of many areas has been degraded by overuse of fires and increasing demand for firewood. Lightweight camp stoves make low-impact camping possible by encouraging a shift away from fires. Stoves are fast, eliminate the need for firewood, and make cleanup after meals easier. After dinner, enjoy a candle lantern instead of a fire. If you build a fire, the most important consideration is the potential for resource damage. Whenever possible, use an existing campfire ring in a well-placed campsite. Choose not to have a fire in areas where wood is scarce-at higher elevations, in heavily used areas with a limited wood supply, or in desert settings. True Leave No Trace fires are small. Use dead and downed wood no larger than an adult's wrist. When possible, burn all wood to ash and remove all unburned trash and food from the fire ring. If a site has two or more fire rings, you may dismantle all but one and scatter the materials in the surrounding area. Be certain all wood and campfire debris is dead out. Observe wildlife from afar to avoid disturbing them. Give animals a wide berth, especially during breeding, nesting, and birthing seasons. Store food securely and keep garbage and food scraps away from animals so they will not acquire bad habits. Help keep wildlife wild. You are too close if an animal alters its normal activities. For additional Leave No Trace information, contact your local land manager or local office of the Bureau of Land Management, the Forest Service, the National Park Service, or the Fish and Wildlife Service. Or, contact Leave No Trace at 800-332-4100 or on the Internet at http://www.lnt.org. For posters, plastic cards listing the Leave No Trace principles, or information on becoming a Leave No Trace sponsor, contact Leave No Trace Inc., P.O. Box 997, Boulder, CO 80306, phone 303-442-8222. Travel and camp in small groups (no more than the group size prescribed by land managers). Keep the noise down and leave their radios, tape players, and pets at home. Select campsites away from other groups to help preserve their solitude. Always travel and camp quietly to avoid disturbing other visitors. Make sure the colors of their clothing and gear blend with the environment. Respect private property and leave gates (open or closed) as found. Be considerate of other campers and respect their privacy. Master of Leave No Trace training courses are available from the National Outdoor Leadership School (NOLS) in cooperation with four federal agencies (the Bureau of Land Management, Forest Service, National Park Service, and Fish and Wildlife Service). Approximately 18 courses are taught throughout the country each year in all types of environments from alpine tundra to deserts. A five-day field course provides students with a comprehensive overview of Leave No Trace techniques through practical application in a field setting comprising a short backcountry trip. If you are interested in attending a Master of Leave No Trace course, call the Leave No Trace hotline at 800-332-4100 ext. 282. Also call that number for a list of Leave No Trace masters in your area. In addition to Leave No Trace, see the BSA Wilderness Use Policy.